Welcome to my vlog, sis! The goal of my vlog/blog is to “Talk to you” like we are sitting across from one another having lunch on a SUNNY afternoon (Or, ENJOYING a good ole’ Happy Hour)! My mission is to inspire you, encourage you and empower you with experiences that you have not yet had in your new career. I will aim to post videos/articles that are relevant to your journey. I welcome you to email me directly (hello@tranettbrooks.com) with a specific question; which may become a short video to help our other sisters on this same journey! (So, please don’t be SHY to say HI!) XOXO! Women want a career in real estate, because we recognize the industry is “better” when women are included. Period. End of post! You like that? LOL! #Metoo. According to the National Association of Realtors, women make up 63% of the total number of Realtors in 2018. I have to enlighten you on WHY women are drawn to a career in real estate. There are so many perks that make becoming a Real Estate Agent worth the time, money and energy to get started. Prior to becoming a Real Estate Agent, I contemplated a career in real estate just like you are now. I searched online for any information that would give me real guidance about what to expect if I pursued this career. Women “thrive” on reviews from other women before we make moves and purchases. We want to know what other women “think about it” and we want to know if we should invest in it, too. Basically, we want to know if that thing we are contemplating really WORKS! You are on my website and reading this article, because you want to know why so many women pursue a career in real estate. There are over 1.3 “million” Realtors in the United States according to NAR. If 63% of these 1.3 million are women; that means over 819,000 women have a career in real estate as a Real Estate Agent! When women choose a career in real estate they know the primary perk is becoming their own boss. You no longer have a boss once you become a full-time Real Estate Agent. (SIDE NOTE: I do not recommend that you leave your full-time job to become a full-time Real Estate Agent. I suggest that you begin this career on a part-time basis.) For some women, becoming your own boss is SUPER ENTICING! The thought of not having to “answer to” or “report to” someone else is like a massage given to you by Matthew McConaughey or Denzel Washington! LOL! The best word I can use to describe the daily life and routine of a woman Real Estate Agent is SPORADIC. Sporadic means occurring occasionally, singly or in irregular or random instances. As a Real Estate Agent, your daily work schedule will be irregular and vary from week to week. For example, Monday you may work from your home office or you may go into the company office to do your lead generation, make phone calls, and respond to emails. Tuesday you may be out in the field showing property. Wednesday you may have to attend a weekly sales meeting followed by a home inspection with your client. Thursday may be spent organizing your paperwork and client files. Friday you may decide to “take off” to chill and hang out doing “whatever!” Saturday you may be back showing property to more clients. And, Sunday you may host an Open House! So, each day is different. All of your weekly work activities are real estate related, but the tasks are not the same each day. If you are a free-spirit and dislike the monotony of a same ole, same ole daily routine, you will adore and appreciate this type of work schedule. One of the BEST perks of being a Real Estate Agent is the freedom to make your own schedule weekly. Yes, your clients’ schedules and needs are usually a priority to your own, but you will have a lot of “flex time” for yourself! Once you are able to anticipate and plug-in your clients’ needs on you weekly schedule, you can decide to use all other time as you choose. For example, on Tuesday you know you have to be present for a home inspection at 2:00 pm until 5:00 pm. you would like to get a haircut, have lunch with a friend and stop by the bank (to deposit your BIG commission check)! Well, you can do all of these personal things before 2:00 pm; then go to work and take care of your client. Just imagine being able to go to your doctors’ appointments, schedule car maintenance, take care of things around the house and so much more! Suppose you son or daughter has a school play a week away. You can schedule your upcoming week to include your child’s play and then, schedule any clients’ needs around the date and time of their play. The flexibility can be PHENOMENAL (if you don’t abuse it)! We all want to make MORE money. This perk is obviously one of the top reasons why women choose a career in real estate. Many women could still be happy on our jobs working 8 hours a day with a boss…if we made MORE money! If you should become a Real Estate Agent you will have the opportunity to make as much money as you can generate through your own abilities and efforts. How much you make is totally dependent upon what you put into your career and business. Prior to becoming a Real Estate Agent, I was maxed out at my job as a Youth Program Director. I think I was making shy of $37,000. I was a single woman at the time, therefore, this salary amount was decent in Arkansas. However, my salary was never going to exceed that by much. I may have eventually gotten to $40,000, but that would have been pushing it to the absolute limit. There was no room for growth either. I was stuck with my maxed out salary. You may be in the same boat. Are you building your entire life around the set amount of money that you currently make? If you do decide to step out of the boat; learn this new skill, you could certainly increase your income and net worth. I started as a part-time Real Estate Agent (since i was employed full-time). My part-time agent status lasted for 3 years. My supplemental income increased significantly during those 3 years (as a part-time agent). Year one, I increased my $37,000 salary by adding $9,467. In year two, I increased it by adding $13,823 to my salary. And, by year three, I had increased my $37,000 salary by adding $57,798! By year three, I began praying for a transition from being a part-time agent to full-time. And, that is when I was released to take that leap. Please don’t be discouraged if you still have to keep your full-time job (or, if you “want” to keep your full-time job). You may have a great job with good income and benefits (that you want to keep). You can use your career in real estate to supplement your current income. It can be your vacation money, for home projects, or real estate investments, college tuition…and, so much more! I began my career in real estate on a part-time basis. If you are serious and committed about building a profitable career; you will not be part-time forever…unless, you choose to remain part-time. I cannot think of too many legitimate careers that will allow you to build a business; and to brand yourself as an expert (like you can in the real estate industry). You can literally become licensed within 45 to 60 days. Where can you go and become a licensed professional in this short amount of time? And, I’m not talking about a certification, but an actual license. Of course, once you’ve passed your exam and obtain your license; you will have a few additional start-up costs. However, you don’t have to purchase expensive signs and marketing materials to get started. You only need a few essentials and you’re on your way. Most new agents that enter our field can get their businesses started with less than $2,500.00. (This start-up amount does include the cost of attending real estate school and your real estate exam.) Plus, this amount is not due all at once or up front; you pay for your expenses incrementally. You will have an opportunity to write off business expenses on your taxes. This is a huge perk for having a business. Today, every working woman should highly consider having a home based business. You will be able to write off expenses for your cell phone, gas, lunches and dinners, electronics, equipment, supplies, real estate dues, postage and so much more! If you only sold 3 to 5 houses per year on a part-time basis; you would still get these same tax benefits. What savvy woman doesn’t want to outsmart Uncle Sam (even if it’s just by a little bit)! I know this may sound cliche’, however, homeownership really is a dream for most individuals and families. It is one of the greatest achievements that most families will make collectively. You will have an opportunity to be part of their journey (whether helping them to buy or sell). In order to be successful as a Real Estate Agent, you “must” have a passion to serve the public with their real estate needs. Your servant heart will bring you the highest sense of fulfillment and joy. Many women work on unfulfilling jobs every day. They are not making an impact. they don’t see the fruits of their hard work and labor. If you become a Real Estate Agent, you will see your hard work manifested throughout the deals that you successfully close each month. You will experience immense joy when you hand over the keys to a first time home buyer, newlywed or put the SOLD sign in the yard of a military man or woman that suddenly has to relocate. The impact on your community as a professional and caring Real Estate Agent is very tangible for both your clients’ and you. 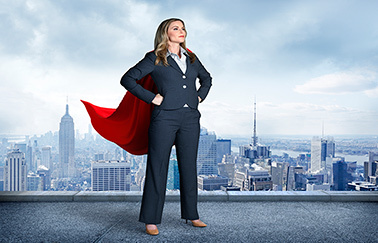 Thousands of women share these same perks and benefits that a career in real estate offers. Each year, women are enjoying: being their own boss, flexible schedules, unlimited income potential, low start-up costs, business tax write offs and helping individuals and families achieve the American Dream of Homeownership. 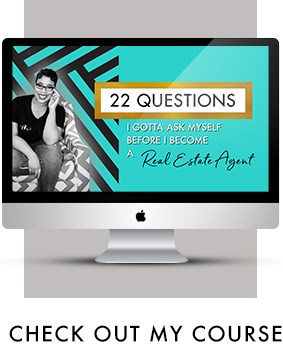 In this empowering (and free) audio training you’ll be inspired to overcome your intimidation and fear, plus get rid of any doubt hindering you from becoming a Real Estate Agent!